It is kind of like when you are on a diet, all of the commercials are about food. I see embroidery everywhere. When we went on our trip to the beach we stopped by my old stomping grounds, Spring Hill College. One of my favorite things on the campus is and has always been the Sodality Chapel. Of course I am as old as dirt and fondly remember when it sat behind Quinlan Hall at the edge of the woods. Just a beacon of serenity that was always open, sitting at the edge of the woods. Loved it. Well the only thing constant in life is change. In 1987 the chapel was moved it to its present location and it has a very pretty garden around it. In those gardens are some statuary. One of them is a statue of St. Ignatius, go figure, a Jesuit college having a statue of Ignatius. :) I had seen this statue before but never noticed the "embroidery" on it. We think that only with a needle and thread can we replicate the intricate embroideries of times past. Wrong, even a stone cutter can remind us of the simplest of beauty around us. Notice the bullion fringe at the end of the stole. 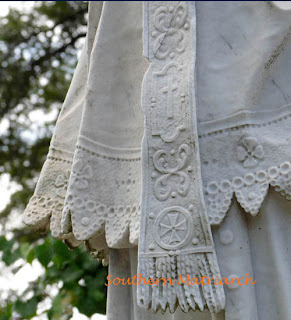 How beautiful the broderie anglaise must have been on the hem of his surplice. There is even the look of entredeux. You never know what you will see if you look around.